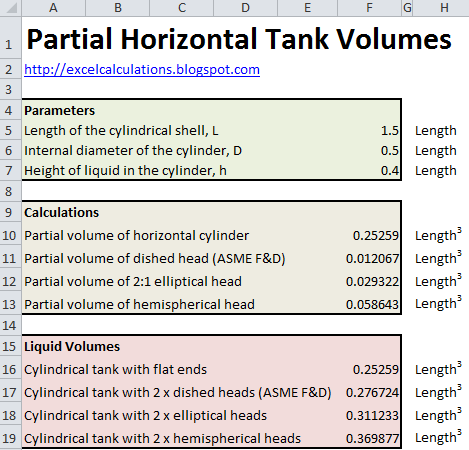 This Excel spreadsheet helps you calculate the liquid volume in partially filled horizontal tanks. Tanks are often used in storing chemicals. Often, only the liquid height from a level indicator is known. This means you need a method of calculating the liquid volume based on the liquid height and the tank dimensions. 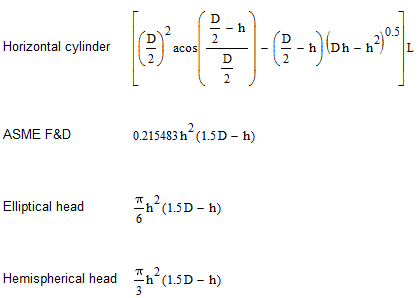 The liquid volumes in a horizontal cylinder, and ASME F&D, 2:1 elliptical and hemispherical ends are given by these equations. The diagram at the top illustrates the notation. Hence the total volume of liquid in the tank is simply the liquid volume in the cylinder plus 2 times the liquid volume in the heads. The dimensions can be specified in any length unit. The unit of the volumes will simply be the length unit cubed. This spreadsheet can be easily modified to created a Dip chart (i.e. a chart giving the liquid volume as a function of liquid height). Excellent article you wrote here, and very helpful I might add. 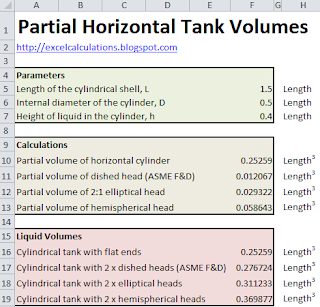 Just wondering if you could describe a little more how you got those liquid volume formulas.